Markets today are experiencing higher levels of volatility, uncertainty, complexity, and ambiguity or VUCA. A market VUCA crisis arises when a threat emerges from the uncertainty that directly impacts a firm’s survival. SMEs (firms less than 500 employees) are more susceptible to a VUCA crisis in the market place than larger firms that possess the ability to absorb more shock. Most literature use case studies of large firms. As SMEs survive and scale management must also still be concerned about how to withstand a VUCA crisis impacting the firm’s business model and value proposition. A key question then is How can SME management ensure their firms are more resilient in the presence of market VUCA? Strategic Anticipation – The capability to determine and the ability to implement a strategy that is highly responsive to an unpredictable and potentially volatile environment. Navigational Leadership – The capability to instill a collective sense of where the organization is and the confidence and optimism to move forward into an uncertain future. Agility – The capability to move rapidly and flexibly in order to shape or adapt to the threats and opportunities arising from uncertainty. Resilience – The capability to absorb and positively build on adversity, shocks, and setbacks. Open Collaboration – The capability to dissolve boundaries, forge links, and reach outside through partnerships and the sharing of ideas and information to gain a broader perspective and maximise innovation. Predictive Learning – The capability to sense, probe, and analyze previously hidden patterns and trends in order to anticipate sudden or disruptive change. Assessing the firm against each of the components of the framework enables management to determine the firm’s readiness to prepare for market VUCA crises, mitigate downsides, and exploit upside opportunities. This framework can be integrated with a firm’s strategic planning & execution process and applies some of same uncertainty management techniques that can be applied to projects and innovation. 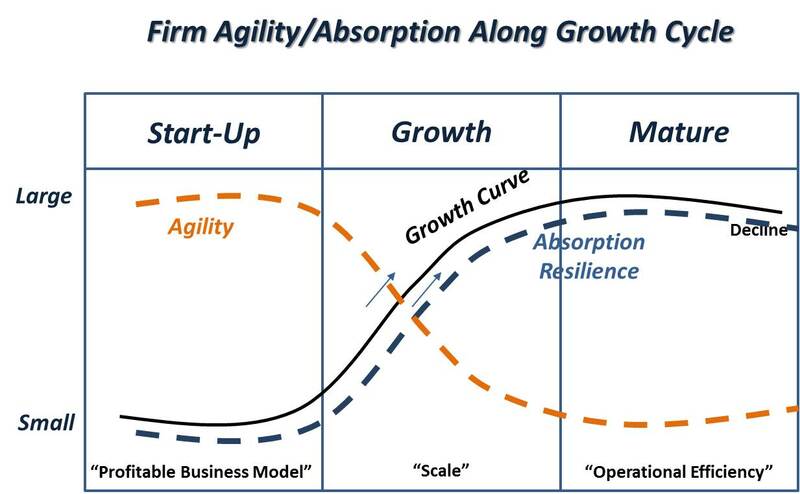 Beyond agility and absorption the other four components are useful to facilitate a more proactive approach to prepare for a unpredictable market VUCA crisis giving more safety margin rather than a panic reaction to a sudden surprise. Inherent agility arising from the smaller size of the firm (as mentioned already). Closely related to agility is the fact that managers and staff tend to be more geographically close enabling faster communications and rapid response. A culture of driving the business by personal relationships (of the owner/founder) rather than professional management. Cost consciousness arising from the tight resource constraints in SMEs. Higher level of risk taking particularly in the earlier stages but diminishes as firm’s grow. Centralized decision making by the owner with a greater coincidence of power between the owner and manager roles. Owner has a direct impact on day-to-day operations. Owner and small management group are often multi-hatted in their management roles and juggling multiple priorities. Owner’s decision making is based on a commercial orientation although may be influenced by personal preferences, desire for lifestyle, and community reputation. The owner may have a lack of ambition to grow and may just give up if the market VUCA crisis is severe enough – this discussion is more oriented towards SMEs that have the potential to grow much larger as opposed to local businesses. Informality and lack of written procedures. Differences between existing employees and new professional employees as the firm grows. Approaches available to SME management in each category of the uncertainty management framework are as follows. Agility is the core inherent strength of the SME. Rather than using this strength for sudden short term reaction the goal here is to exploit agility with a longer time horizon to buy time to survive. Fast opportunity exploitation – the ability to spot fast and shift quickly focus (pivot), resources, cash, and management attention to new opportunities. Ability to say no to new opportunities to enable the firm to focus its constrained resources. Maintain flexible people, organization structure, and processes. Find and seize opportunities to improve efficiency to free up highly constrained cash to fast exploitation. Fast time to market for new products and services – supported by fast experiments and rapid learning. Exploration during seasonal low in annual cycle. Exploit in the rest of the year. Nurture a culture of agility that avoids status symbols, building a hierarchy, transparency of information, and performance over founding employee tenure. Preserving staff rather than cost cutting and emphasize hiring flexible staff. If able to acquire, buy new businesses not mature businesses. Maintain low fixed costs in core operations to minimize cash drain from a sudden VUCA crisis. Build a war chest even if it is not large to fund fast opportunity exploration. Customer lock-in from high switching costs in profitable core to buy time. Seek protected core markets as much as possible leveraging personal relationships. Seek powerful patron with vested interest in the success of the SME such as a customer or investor. Categorize and differentiate ‘good fat’ and ‘bad fat’ to support modest cost reduction of ‘bad fat’ first. Spend time with staff defining what these two categories mean. Engage staff eliminating ‘bad fat’. Cut ‘good fat’ as a last resort. Before looking at the remaining four components of the uncertainty management model it is important to look at the coincidence of owner power present in many SMEs as this can harm the ability of the firm to withstand a market VUCA crisis. The higher coincidence of power resting with owner of a SME rather than a corporate board presents the most difficult challenge for managing a market VUCA crisis. The Greiner growth phase crisis model suggests that smaller/younger firms can pass through several crises in the early stages related to crisis of leadership, autonomy, and control as the firm becomes too large for the owner to personally direct. These are internally focused crises and key crucible milestones for the SME. Assuming the ambition of the owner remains growth as opposed to a lifestyle preference a market VUCA crisis creates a life or death decision point for the owner putting their personal preferences in direct conflict with the long term survival of the firm. Faced with a VUCA threat to the core business the owner themselves may become the problem and must recognize that they need to loosen control of decision making and involve SME management and staff more in decisions impacting the firm. Owners need to consider if their personal preferences are harming the ability of the SME to prepare for a market VUCA crisis. Market VUCA can create strong anxiety and fear in the workforce particularly in SMEs who are more exposed. Although employees working in SMEs are more resilient to survival stress management must still display confidence and optimism moving forward through a clear vision and goals. VUCA can sap morale and energy. See a VUCA crises as an opportunity. Inspire confidence by making sense of the external environment, explain why action is needed, and articulate a clear vision. Maintain speedy decision making process and avoid centralized control. Owners need to give up decision making power. Engage staff in determining how the firm will move towards clear vision. Make allowances for course corrections in the vision because not everything will be known in the presence of VUCA. Keep staff focused on the new mission. Establish a diverse and collaborative mindset in the growing SME culture. SME management needs to make thoughtful choices in spite of VUCA, assess alternate scenarios, consider implications, and prepare accordingly. Avoid becoming internally focused as the firm grows and more institutionalized – always stay external focused as formal processes are established but ensure continuous improvement embedded in the culture. Just In Time Approach to strategy setting, risk taking, and resource allocation that support agility. Develop the ability to do fast option evaluation with informed go/kill/hold decision making. Need to constantly question the assumptions of the business (Drucker) including: assumptions about the environment in particular (society, structure, market, customer, technology); assumptions about the SME’s mission; and assumptions about the core competencies needed to accomplish the SME’s mission. I would add assumptions about the owner’s preferences as the elephant in the room that needs to be addressed hastening resolution of the crisis of control in Greiner’s model. The connection of the SME with the outside world is highly influenced by the personal relationships of the owner with customers. Open collaboration in large firms is about breaking down the walls of the organization and connecting with the external market. In the case of an SME open collaboration is about moving beyond the personal relationships of the owner. Collaboration in this case is a means to adapt for the firm to survive in the long term. The goal is spot shifts sooner in core markets and avoid owner’s blind spots. Owners again need to self reflect and decide if they are a barrier to open collaboration and the firm moving towards thinking as a “collective brain”. Develop a collaborative mindset throughout the organization – open to new ways of thinking, new ways of drawing in knowledge and insight. Developing sources of new ideas by crossing industry borders, government organizations, strategic suppliers, and partners and getting beyond geographical borders. Considering ideas from other industries is particularly important for SMEs. Share information freely throughout the firm and avoid using information as a weapon. Collaborate with customers through social media, co-creation, and crowd sourcing if appropriate. Look for opportunities to make temporary alliances for shared resources (keep fixed costs down), joint activity, technology transfer, R&D consortia, industry standards groups, and innovation networks – reach out to universities for new ideas. Predictive learning provides the outside view to spot new opportunities to enable fast time to market. Being the first to “connect the dots” in a new way. Exploring customer problems more deeply looking for opportunities for new value creation. Track trends in the market place. Apply double loop learning which is to not just solve the problem but also open up thinking to modifying the goals of the firm to unlock new value creation. Facilitate intrapreneurship within the firm – align intrapreneurship with navigational leadership. Apply basic analytics and data mining of any data the SME has collected to date. Consider if data should be collected and tracked that is not at the moment. Open the team’s mind with new ideas and foster discussions that challenge everyone’s mental models of the way the market is that may be constraining thinking. Learn to act quickly on incomplete and ambiguous information. SME management should consider how some of these uncertainty management approaches could be adopted by their firm. SME owners should reflect on how their personal preferences influence their decision making that may harm how a firm responds to a market VUCA crisis. This entry was posted in Managing Uncertainty on September 27, 2013 by Andrew Reif.